Ahab's Revenge V2 is a complete reworking of the original. 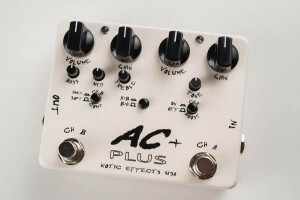 Right Switch = warm, rich vintage-voiced preamp/drive with external volume control. Combining these two circuits covers a lot of territory, all the way from boost to light fuzz tones. Ture Bypass, Usa hand-made, hand-wired, and hand-painted. The Palatine is a no-nonsense, true-bypass clean boost boasting close to 30db in pure clean boost. We all know what this one does. USA hand-made, hand-wired, and hand-painted. 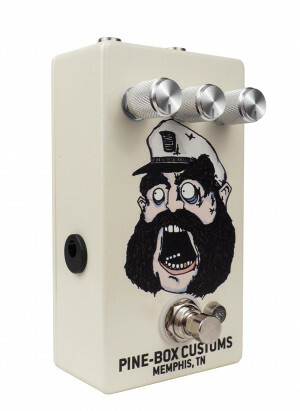 The flagship overdrive from Pine-Box Customs. Ahab is a touch-sensitive, amp-like, crystal-clear overdrive. Ahab was produced to redefine the term "transparent". With his all-analog circuitry, Ahab delivers rich and warm low-medium gain overdrive tones. While Ahab will color your tone slightly, as all sound devices will, Ahab does so with the utmost civility, leaving your core tone intact...simply improved upon. What's more fun that taking pristine, printed Ahab enclosures, that you spent hours perfecting the design of, and scratching the absolute hell out of them? Thats a great question. Keep in mind that AC/DC’s Back in Black is one of the best-selling albums of all time. 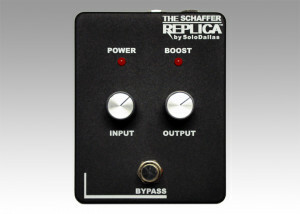 Much of the lead guitar tone of Angus Young from that magic era is due to the Schaffer-Vega. The SVDS sported a clean boost, a compressor and an expander (companding) in its audio circuitry, allowing it to further overdrive the amplifiers and add a unique signature to the sound. 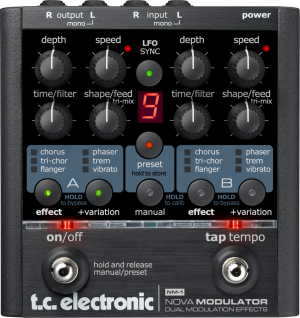 As with all guitar effects or sound effects in general in the known universe, some will like it and some won’t. We have tested the original Schaffer-Vega and its Replica extensively for two years and published many videos with it.